Mauro Pallotta is a 41 year old artist and sculptor based in Rome. 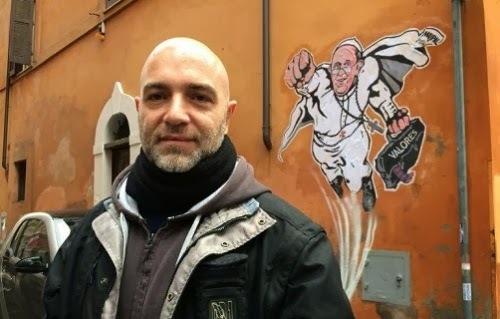 But Pallotta may better be known as a celebrated street artist based on widespread notoriety of his graffiti "Super-Pope" Francis on the Via Plauto, a tiny cobble stoned street in the Borgo Pio district near St. Peter's Square in Rome (Vatican City). It dawned on the artist that this Pope also had superpowers in the form of humility and empathy. Pallotta likened Super-Pope to "It's a little bit like Greek mythology brought to modernity.” In depicting Pope Francis as a superhero using his papal authority for the good, the pontiff is shown as a pop style dressed in his understated white cassock, simple shoes and an iron pectoral crosscross as the Super-Pope carrying a black briefcase labeled "Valores" (meaning values in both Latin and Spanish). This symbolizes that the first New World Pope only carries his Christian values. A red and blue scarf is hanging out of the briefcase, which is for the Argentine San Lorenzo de Football (soccer) club, which the Pope been a fan of this underdog team since his boyhood. Pope Francis greeted players from San Lorenzo at the Vatican in December after a Wednesday general audience to congratulate them on winning the Tornial Incial championship. Pope Francis has repeatedly spoken of the spiritual values of sports teams. His Holiness exhorted Argentine and Italians sports clubs that: "[R]ugby is like life because we are all heading for a goal, we need to run together and pass the ball from hand to hand until we get to it". 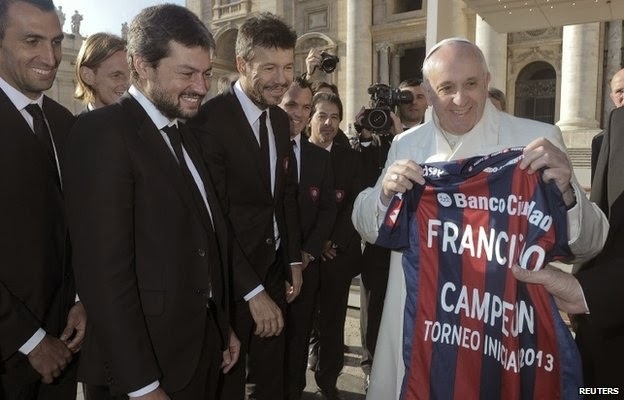 The artist explained that the San Lorenzo soccer scarf brought Super-Pope Francis to being human. However, considering Pope Francis' connection between sports and spirituality, carrying the San Lorenzo scarf with his values "baggage" , it can be seen as a reminder that even a "Super-Pope" needs the support of his underdog team to achieve the goal of advancing the kingdom of God. 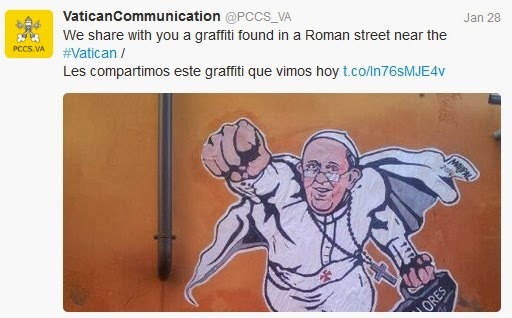 Vatican Communications embraced Pallotta's Super-Pope folk art tribute by posting it on its Twitter feed. The Super-Pope graffiti art lasted but a day, as Rome's decorum police acted faster than a speeding bullet took down this street art in record time.